After reading through related posts in this forum and running tests and validations with the anritsu spectrum analyzer and LimeSuite GUI to measure the various powers at different frequencies for the LM7002 board, I find that there needs to be a clarification as to what the maximum ouput power is for this board. I hope the administrators could shed some light in to this topic as I see that it has come up in many posts but none of the answers are definitive. Issue: the LM7002 spec datasheet has on the first spec table that the max RF output power is 0 dBm but the advertised output power is +10 dBm for the board. Now, measuring signal at various frequencies for tx 1_1 high band I get anywhere from +17 dBm to +20 dBM depending on what tweaks I make inside LimeSuiteGUI. their chart has -30 dBm at 200 MHz while I have +17 dBm. Does anyone have the INI file that they used to generate that chart? they mentioned in the manual they used a wcdma cw under the picture but on the setup on top of the picture they said they used the one tone cw signal. Also, does anyone have screenshots of the analyzer they used in those measurements to see what span, rbw, reference signal and input attenuation they used since these settings are important to reproduce the same results in other analyzers I was hoping the administrators can provide more insight as to how they obtained their chart for output power vs frequency. Thanks for any clarification that may be provided! 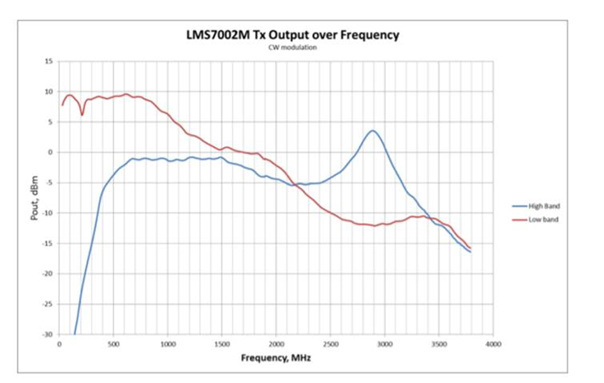 LMS7002M datasheet specifies the typical output power that can be expected with reasonable matching network - it does not state that higher values cannot be achieved (with proper or frequency selective designs). 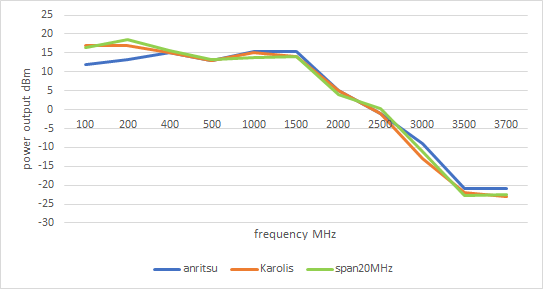 The figure you added from the LMS7002M was obtained with a different board - hence different matching (blue graph was obtained with a TX matching optimized for 2.8GHz region). It just showcases that the typical value stated in the datasheet can be obtained with proper matching networks for specific applications. your input is greatly appreciated!! this and the last responses you gave in the previous thread “Regarding TX power” solve all my issues and confirm my doubts about the max transmit power. Thank you again and I hope that this thread helps anyone else with similar questions. I am new to limeSDR and I am loving it!!! It just me that can’t access the topic? I can access it. But it may have a private status or something similar. Maybe some of the forum managers can give a clear explanation for this. Me either… can not reach that post. I believe you have to login to this forum in order to see the previous post, so create an account and that should do it. I think originally it was just a private message and when I didn’t find it in the general forum I created this topic so anyone could benefit from it. But this topic has everything you need to validate/reproduce the tx output power vs frequency graphs. The only thing missing here is the ini file Karolis shared with me that has the configuration, I wasn’t able to attach it here as I don’t have permissions to upload that type of file. I am sure Karolis could re-enable the link if you guys need it. When you load the .ini file, please go to TxTSP tab (when A channel is selected), write “7fff” to the field called “DC_REG:” and press “Load to DC I” and “Load to DC Q”. NOTE: the manual for the lime sdr has explanations for ever field in the GUI, that should help understand some of the configurations, it helped me a lot. a span of 10MHz for the test, where RBW and VBW ratio was 100 kHz. I hope this helps but if you guys have a specific question maybe Karolis or I could help you with that, I think it would be best to just post here so that there is one main post for this topic. It has been made public.